* These fantastic Nozzles allow up to 30 cubic/mm per second by changing the Nozzle Only! Ramp up plastic output thanks to our patented core heating nozzles and fully utilizing the Bondtech feeder already installed in your printer. By combining nozzle size, layer height and speed you can achieve up to 30 cubics / second. The nozzles are brass, and are coated with a layer to prevent them from reacting with the aluminium block. This ensures that you can change nozzles without fear of destroying the heater block. This Nozzle allows "volcano-speeds" by just changing the nozzle (0.25 makes no difference). 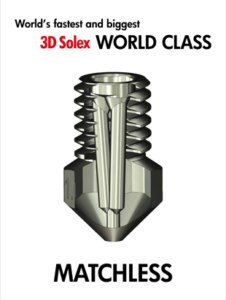 The Matchless nozzles, patented by 3D Solex, have a melting zone much bigger than an ordinary nozzle. An ordinary nozzle is melting the filament from the "outside" and trying to push the coldest part (centre of filament) through the exit hole of the nozzle. The core heating effect of the Matchless nozzles is melting the middle of the filament, that part which you wish to push out through the nozzle. What the others must do: Lengthening the heating zone, which has a negative effect on retractions, adds weight to the head and is costly. 1) You can now change nozzle risk free and hazzle free, by using the tool available separately. Change nozzle in seconds, without risk of destroying the sensors of the printer or the heat break. 3) Print with a lower temperature. Since you are effectively melting the plastic you can print at a lower temperature than before. Using the existing settings of your previous print, you can lower 5-15 C.
Example: You can now print a vase with a 0.80mm nozzle at the same or higher speed than you could using a 0.40mm nozzle previously. This way you only need 1 pass to make a 0.8mm wall. TOOL IS NOT INCLUDED, AVAILABLE SEPARATELY. Super Slip Oil to use on Rods Only! A GREAT Product! Will Never dry out. Will never corrode your precious printer. Will never turn into wax, ever!